Seeders was described by Douglas Preston as "gripping and brilliantly original." Her debut novel The Colony received a starred review in Publishers Weekly, and Booklist called it "a frightening combination of well-researched science and scenes of pure horror." "I like to write about nature because it can be a brutal place—kill or be killed" she says. "But it's also filled with a sort of beauty and logic that makes you wonder which species are truly evolved. Humans have a tendency to separate themselves from everything non-human. We consider ourselves above nature, not part of it. I think it's important to recognize what we have in common and gain a better understanding of all living creatures that share this planet." Colucci spent 15 years as a newspaper reporter, magazine editor and writer for corporate America. 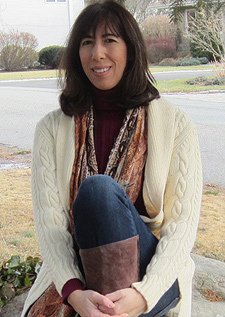 Today she is a full-time author who lives in New Jersey with her husband, two daughters and a couple of adorable cats. A.J. is a member of International Thriller Writers and Mystery Writers of America.